Rangers chairman Sir David Murray has condemned fans who were involved in violent clashes with police after the Uefa Cup Final in Manchester. Sir David said the club was working to ensure "severe action" was taken against those responsible. He was speaking as new video footage obtained by BBC Scotland showed Rangers supporters kicking and punching police officers and attacking vehicles. Eleven supporters have been charged with public order offences. A further 11 Rangers fans, who were arrested, have been bailed pending further inquiries. Another 12 supporters of the Glasgow club were arrested and cautioned, and seven men, including one Zenit St Petersburg fan, were released without charge. Rangers lost Wednesday's match against the Russian champions 2-0. Up to 200,000 fans converged on Manchester before the game, the vast majority of whom did not have tickets. Sir David said the club had been analysing the disturbances "non-stop" since Wednesday night. He confirmed that Rangers would ban, with immediate effect, anyone found to have been involved in the disturbance. The Rangers chairman added: "On behalf of the club I am grateful for the recognition from Manchester City Council, Greater Manchester Police and many Mancunians that the overwhelming majority of our supporters behaved well during their visit to the city and were a credit to the club. "We deplore the actions of a small minority who were involved in the disturbances and support the severest action taken against them. "We are continuing to liaise with the police and city councils in Manchester and Glasgow and will be assessing all relevant information over the coming days, including numerous reports given to us by our supporters, before making any further statement." On Thursday, Greater Manchester Police released CCTV footage of Pc Mick Regan being kicked, punched and stamped on by Rangers fans after he slipped while trying to get away from bottle-throwing supporters. Pc Regan, 47, only escaped serious injury after a mystery man, who claimed to be a member of the British Army, came to his rescue and helped him escape. The constable later described the riot as the worst incident he had seen in 23 years with the police. 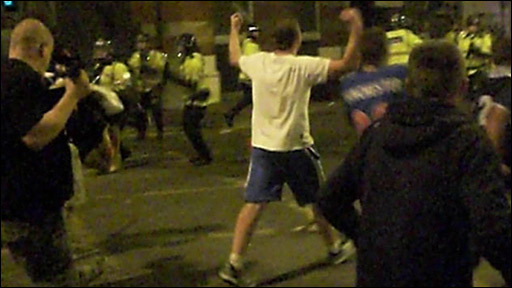 A new video filmed by a Rangers fan and obtained by BBC Scotland shows further scenes of violence in the city centre. A large crowd of supporters are shown carrying out a sustained 10-minute long attack on police, who are forced to call in riot officers dressed in full tactical gear. Police dogs are also deployed to help bring the crowd under control as a barrage of missiles rains down. It shows a group of about 30 people kicking and stamping on an officer as he lies on the ground before colleagues arrive in a van to rescue him. 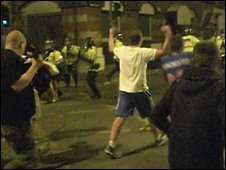 One Rangers fan repeatedly kicks a police van before he is joined by a gang who attempt to force their way into the vehicle to attack the officers inside. The mob, many of them with their faces obscured by scarves, then turn to their attention to a parked sports car which has its windows smashed as fans jump on its roof and attempt to tip it over. Fifteen officers were injured and a police dog badly injured a paw, while one Zenit St Petersburg fan was stabbed at the City of Manchester Stadium. Some trouble flared after a big screen that was due to broadcast the match to 20,000 fans failed 15 minutes before kick off.